I am always very honored when I am nominated for a blogger award. I believe that it speaks very highly of your blog when a fellow blogger takes the time to recognize your blog to other people. I think that it is also a great opportunity to bring light to other blogs that you follow and enjoy. 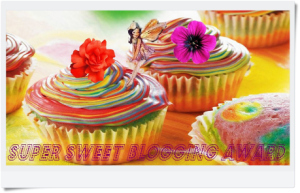 I want to thank Carol at The Hurt Healer for nominated me for the “Super Sweet Blogging” Award. I believe Carol & I met on the 2012 Blog of the Year Award Facebook page and we have been fast friends every since. Her blog is very enlightening and encouraging. It always makes my day when she takes time to comment on something that I have written. Thank You, Carol!! So now I am going to graciously accept my award nomination, but add a little different twist. First, I will answer the super sweet questions, but I want to give the bloggers that I nominate to either accept the Super Sweet Blogging Award or the Very Inspiring Blogger Award. The rules are very similar, but more importantly, I just want others to take the time to visit the sites of the bloggers that I follow. As I was reading through the recent posts, there was somewhat of a common thread or theme, that someone out there needs to read. Well, I have rambled enough…. so here goes! 2. Chocolate or vanilla? Chocolate, but sometimes vanilla is a welcome change of pace. 4. When do you crave sweet things the most? When I am bored. 5. If you had a sweet nickname what would it be? Candy, fancy that! 4. Nominate 15 other blogs and inform them about it. This entry was posted in Random and tagged Inspiration, Life, Motivation, Super Sweet Blogger Award. Bookmark the permalink. Wow! Thank you so much! This is awesome. I especially get a kick out of the Super Sweet Blogging Award. Congratulations Candy! And thank you for such a sweet treat! Thank you very much! I love your blog….